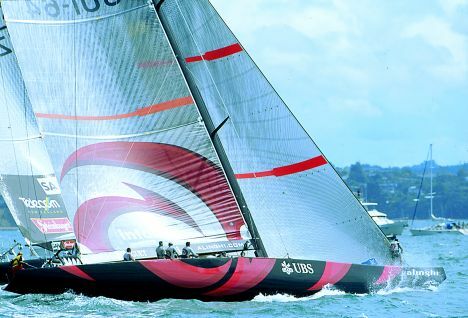 It seems that designs for increasingly larger boats are springing up everywhere of late. Larger but I wouldn't say more technological inasmuch as they remain "simply" large vessels. In fact the trend we have been seeing recently aims at increasing vessel size and consequently mast height, but without necessarily developing constructional or material technology, as happens for example with open 60's or "tri" 60's. The answer is simple, which is to say large dimensions involve great loads, great risks and above all great costs. So these designs tend to develop more conservative philosophies, since the dismasting of a 50 metre vessel involves consequences that are certainly more catastrophic than in the case of a day- boat. 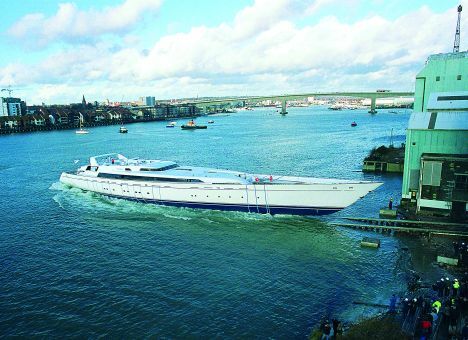 To give an example, consider that the new superyacht Mirabella has its plating impregnated with vinylester resin, which is to say a resin that is no longer used even on small boats where the better performing epoxy resin is preferred. On the other hand it is much easier to find operators skilled in working vinylester, just as there are less risks of error or polymerisation. Going on to consider masts, we may say that when we think of mega/maxi yachts today there is practically no longer the problem of choice of materials inasmuch as carbonium is more or less the only material capable of taking enormous loads without being excessively heavy. Aluminium is still used where tradition remains to the fore, such as in Holland or Germany, but never for boats where performance is not among the main objectives to be achieved. 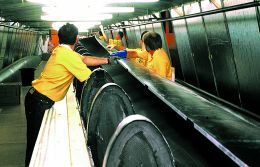 It having been established that carbonium fibre is the main material, another axiom must be stated, which is to say that practically no masts are now created without the use of the vacuum, or better, of the autoclave. In fact the high number of layers in a mast cannot absolutely accept simple manual compaction inasmuch as there would be an unacceptable quantity of vacuums such as to render vain the use of carbonium. On this subject consider that the minimum thickness of a maxi mast is about 5 mm. while the maximum thickness for a superyacht may even be 80 mm; knowing that the average thickness of a layer of pre-impregnated compacted with the vacuum is about 0.4 mm, it may be deduced that in the two cases put forward the number of layers will be from 12 to 200! So the main problem to be faced by "mast-makers" is how to succeed in making all these layers adhere perfectly to one other. Also because, to complicate matters, there is the geometry of the mast itself which not only has on average an elliptical profile but in certain cases has angles of up to 90°, with the consequent difficulty of flexibility of fabrics that resist folding. So though there are excellent vacuum technique products, the builders' dream is almost unanimous: the autoclave. This instrument, which permits a pressure on the laminate of 3 - 5 bars, guarantees the best possible compaction. I would like to underline a fundamental aspect: excellent laminators, in possession of the correct construction procedure and employing the vacuum will certainly come up with an optimal product. 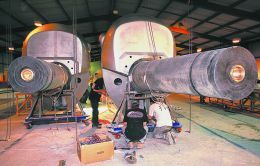 But the same cannot be said of an autoclave in the hands of inexpert builders. Inasmuch as if the laminate is well set up beforehand the vacuum will be sufficient to give the right compaction, whereas 50 layers with poor cohesion will be irremovable even with the most high performance autoclave. At this point we should take a general look at the polymerisation of the resin phase, a step simultaneous with or in some cases subsequent to compaction of the layers. Almost everyone nowadays takes the laminate to temperatures over 70°C, in certain cases up to 140°C. This is in order to ensure total reticulation of the resin and, at the same time, push resin performances upwards which go in step with the reticulation temperature. sliding oven that "cooks" the mast a bit at a time (for masts over 50 metres). 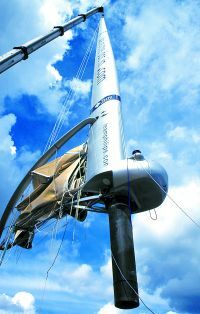 A new method was experimented with in building Mirabella's mast: flexible panels containing electrical coils were applied to the mould. The panels heat up when current is passed through them. The longest part of the job begins when the mast is removed from the mould: the application of fittings and reinforcements and the drilling or cutting of housings for shrouds, halyards and spreaders. 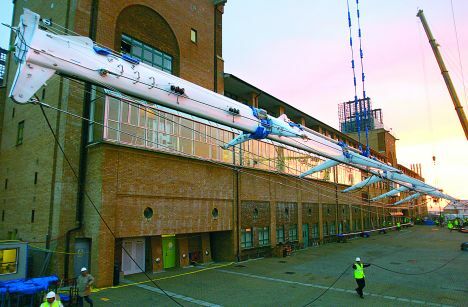 In many cases before this work is done the mast has to be assembled since masts are often made not in one piece but may consist of a front and back, or a right and left side and even an upper, middle and lower part. In all these cases it is obviously necessary to join the pieces and ensure that these joints neither contribute too much weight to the structure nor constitute weak points. This operation may be carried out by gluing the parts, by gluing and bolting or by gluing and subsequent lamination of reinforcements. It is superfluous to say how delicate this operation is. It is often one of the causes of greatest "preoccupation". But actually, none of the problems I've encountered with joints have ever jeopardised the structure. 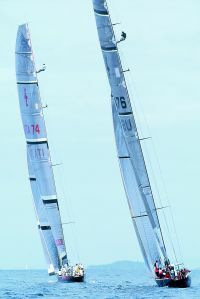 Currently the most important mast design solutions are found in the "millennium rig", invented by the New Zealanders during the 2000 cup, in which two spreaders are replaced by an equal number of intersections of the diagonals within the mast, and the system known as AerorigT. The latter envisages the use of a wing- profile mast without shrouds, rotating on its own access and equipped with a boom for mainsail and for jib. Apart from these two solutions there is nothing new inasmuch as the other cases are limited to building ever taller masts but without any real design revolutions. Weight is kept down and certain elements are simplified, chiefly the use of running backstays which have now practically disappeared from maxis upwards. Masts taller than 30 metres give us the chance to see daily what unexpected consequences, but also what fascination, may derive from the desire for gigantism. To give an example, just think that one of Mirabella's mast-head halyards weighs more than the operator who carries out the normal rigging inspection. The millennium rig, which started out as the "final" choice for every maxi, was subsequently re-dimensioned since the reliability of a greater number of spreaders is not replaced by the intersection of the diagonals. Moreover, there remains the fact that proper adjustment of these masts certainly requires more time and highly expert personnel. In practice the mast is rotated in accordance with wind direction while at the same time mainsail and jib are set to the ideal angle. The advantages regard both aerodynamics and practicality of manoeuvre: the only setting that remains is the rotation of the mast, since main and jib sheets have been done away with. 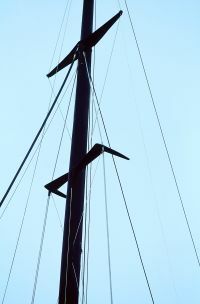 Moreover, with the wind abaft the beam, the jib is in a privileged position in comparison with the traditional rig because it is not in the lee of the mainsail but equally exposed to the wind. I was personally involved in a project called "Erika", in Holland, in which the rig chosen for a 47 metre aluminium vessel was precisely a 51 metre aerorig. In this case the mast was created in two parts, front and rear, and I should point out that during checks of the front part you could actually walk inside the laminate: unlike the usual mast laid out on two trestles, this seemed far more like the hull of a vessel. 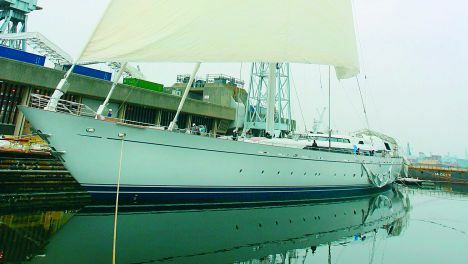 The owner's intention was to create a yacht that could satisfy his desire to make long voyages with only a family crew, so the deck plan was appropriately simplified.